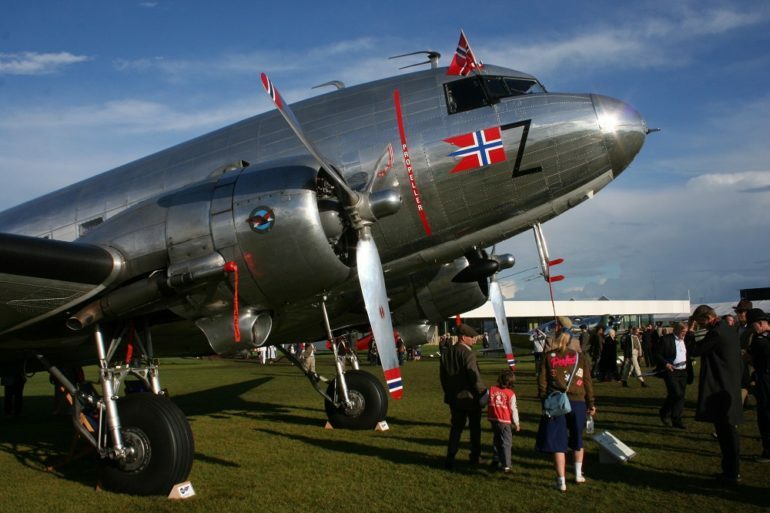 This Douglas DC3 was one of many aircraft in the Freddie March Spirit of Aviation display. The sell-out capacity crowds that trekked down to Sussex for the twentieth running of the Goodwood Revival soon forget about the pouring rain and glutinous mud in the car parks, wallowing instead in nostalgia as they enjoyed some fantastic action on the track, in the air, or in the many displays around the circuit. People watching was a popular pastime too, with period fashions of every conceivable taste to be found. 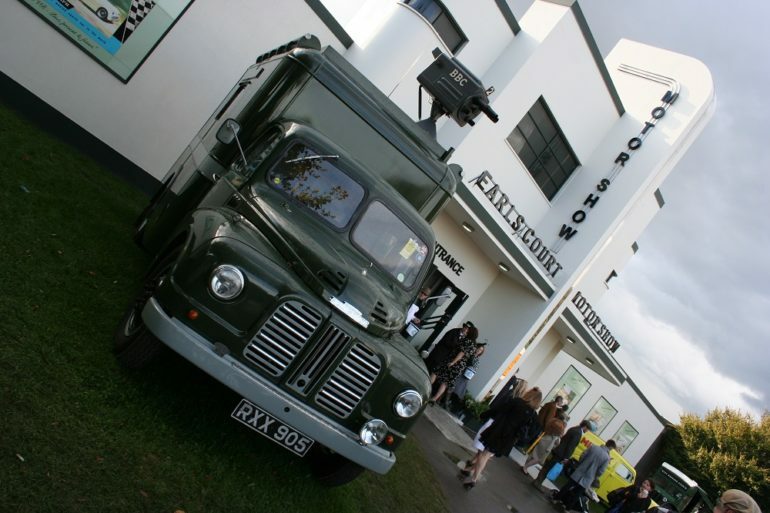 Even Earl’s Court gets transported down to Sussex. Racing for a variety of classes of machinery dating from before 1966, ranging from evocative pre-war Grand Prix cars like the Alfa Romeo Monza and ERA to the Le Mans-winning Ford GT40’s of the mid sixties provided plenty of thrills and spills. As ever, the headline events were the two-part St Mary’s Trophy race catering for saloon cars, and the RAC TT, which is hotly contested by Sports GT cars from the early sixties. This years’ TT saw a mighty battle between snarling Jaguar E-Type’s and venomous AC Cobra’s, with the winning E-Type being penalised back to second place after driver Chris Ward tapped a rival AC Cobra into a spin, handing victory to another Cobra. Fourth place went to a TVR Griffith, just as as a brand new model bearing the same name was being revealed to the public for the first time in Goodwood’s ‘Earl’s Court’ Motor Show. 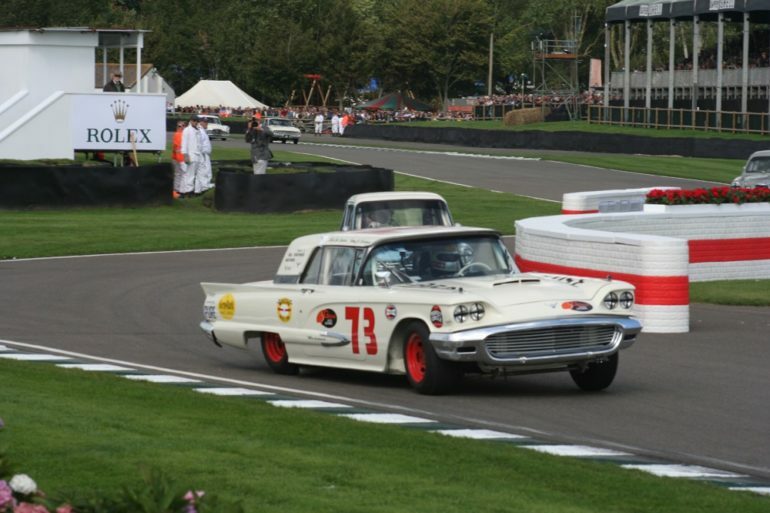 Tom Kristensen gets his Ford Thunderbird sideways in the St Mary’s Trophy race. The two-part St Mary’s Trophy race saw incredibly rapid Austin A40’s battling it out with yet more Jaguar’s – unlikely you might think, but the modest little saloons are heavily modified these days, the front-running Austin’s powered by versions of the venerable BMC A-Series engine that reputably cost £18,000 to build! Perhaps unimpressed by that, the crowds in the grandstands reserved their adulation for Tom Kristensen, the many-times Le Mans winner having man-handled a monstrous Ford Thunderbird from near the back of the field to slip-slide his way up the order before being forced to retire. Jackie Stewart at the wheel of a Jaguar D-Type during the Ecurie Ecosse tribute. As always, the Revival featured tributes to great names from the past and this year it was the turn of Ecurie Ecosse to be honoured. The team was founded by Edinburgh wine merchant David Murray to further the careers of Scottish racing drivers and after a brief foray into Formula 1, rather concentrated on sports cars, culminating in victory at Le Mans in 1957 with a Jaguar D-Type. 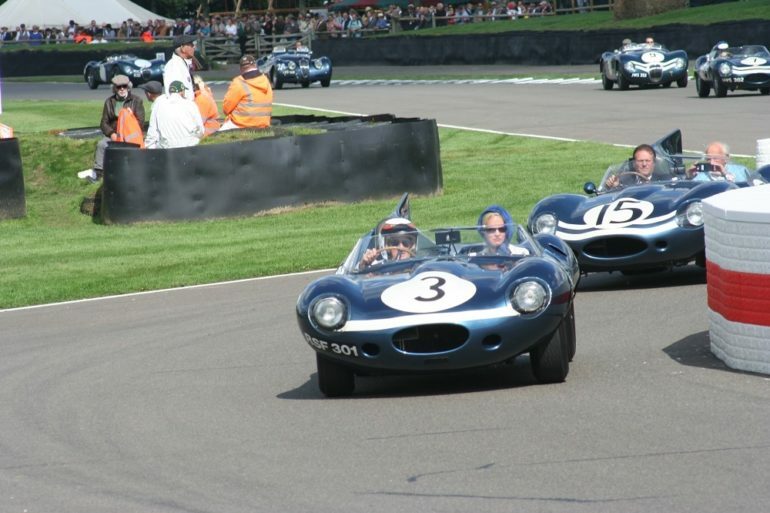 Three-times F1 World Champion Jackie Stewart was one of the young drivers to hone his driving skills with Ecurie Ecosse and he was behind the wheel of that ’57 Le Mans-winning Jaguar for the track demonstrations at the weekend. A more recent Scottish star – and a protege of Stewart’s – was Indianapolis 500-winner Dario Franchitti, & he added to his CV by driving the team’s iconic Commer transporter around the track. Dario’s comment as he climbed down from behind the wheel? “Mega! That one word amply sums up the Goodwood Revival as a whole.